Are you responsible for planning professional learning? 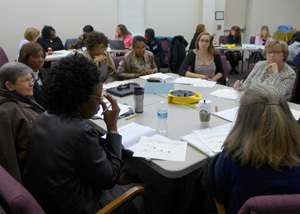 While many educators know NCTE as the home of award-winning professional journals, national conferences, and the ReadWriteThink website, you may not know we have also been quietly supporting K–12 schools across the country in building effective learning plans around improving literacy teaching and learning. What does it look like to partner with NCTE? Using a combination of survey tools, onsite visits, a review of school and district documents, and interviews, we can facilitate conversations onsite that help triangulate these data sources to pinpoint changes in practices that will have the most immediate impact on teaching and learning. If you have already identified literacy needs, we can provide literacy expertise for full day workshops and institutes, keynotes, breakout sessions, and consulting with leadership teams on implementation of effective collaborative professional learning models. Starting with an audit of time available for professional learning, we can help you build a plan that supports cohesive ongoing professional learning aligned to district goals. Do you have strong teacher leaders and/or effective collaborative practices already in place? We can provide school-wide, digital access to resources designed specifically to support school learning communities. All NCTE professional learning resources and services are designed based on the NCTE Principles for Professional Development, valuing sustained learning activities, engagement with both teachers and administrators, and community-based learning. Tell us about your needs! Complete the Online Request Form, call 800-369-6283, or email us today with your school’s needs and goals. We will recommend a professional learning plan to help you meet those needs. This document was printed from http://www.ncte.org/consultants.